Amelyn Veloso, the former News5 anchor, is now part of the fastest-growing TV news organization, Solar News. 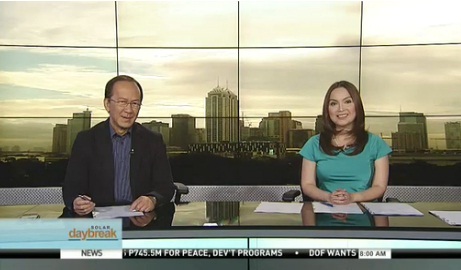 Veloso, who just made her debut this morning on Solar Daybreak, has officially been named co-anchor of Jing Magsaysay. Aside from her duty on that show, the young news veteran will also begin anchoring the morning shift of the Sunny Network's news bulletin — Solar News Update. Veloso was among the original news talents of the old ABC5 and has anchored a number of newscasts during her 14-year stint there including The Big News and Aksyon Weekend. She was last seen as anchor of the noontime newscast Balitaang Tapat with Raffy Tulfo.